The other day a column was dealing with a reader who was pondering breaking a friendship because the significant other of the friend was getting on their nerves. The reader was asking for a way to "let things wilt away", and the columnist replied that strainght forward confrontation is the best way to go, because that way you give a chance to your friend to reply, though you may not like the reply. The line sent chills down my spine due to the issues I have with Friend Trouble. In my case it isn't a case that I want to break up with her because of her husband, but because of her. Fiending off the unpleasant appendage is rather easy, by simply fixing dates and get togethers "just for us". I've two friends who can't stand each other, and though once they tried to get along for me, it was awkward, so one of them came first and said: "look, I love you, but I can't stand Friend 2, so if you'd like to spend time with them, please don't include me or the next time you'll have to visit me in prison". There's no biggie in that, right? I certainly don't like people badmouthing my friends, but I don't expect all of my friends loving each other. Love can't be imposed. When someone is so bound to another person they can't simply go anywhere or visit anyone without that person, well, I would say that we have a problem. Just because you love your partner and you think that they are the most lovable, perfect person in the planet, it doesn't mean that the whole world is supposed to see them that way. And some of the people with a disagreeing view might be your own friends. So yes, commitment should be able to be brokered so that the time spent together would be good for everyone. The plot thickens where the problem is your friend. How do you deal with that? What do you say? "Sorry dude, but you used to be smart, fun and lovable and now you've become stupid, boring and annyoing"? It might be coward, but sometimes letting things die is the best way. Would you rather go away with a happy memory somewhat faded in the end, or will you rather go away with an unnecesary wound caused by trying to explain something that's hard already, and getting new things in result that may end up bittering the whole thing? 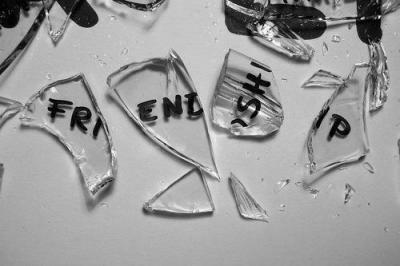 Some wounds don't need to be picked, and sometimes a friendship that's getting broken is exactly that kind of wound. Fading away can keep intact the good memories, while the frontal "I can't be your friend anymore, let's part ways" can sour the whole thing up. I know, I've been in both cases more times than I care to count. Besides, fading away leaves open the chance to maybe get back together in the far future if things change, while a frontal breakup burns the bridges behind you. I guess this is just a matter of deciding what are your motives and what can you foresee in your future and if any type of reunion would be acceptable for you.